CraftedBattle by C-Apps is a $1 app that allows you to create maps and play death matches on them. Think of it as minecraft meets first person shooter. CraftedBattles artwork is based off of the popular title Minecraft. You have a sort of 8-bit retro block interface around you and in this case its your battle grounds. You can battle against bots or friends in a battle to the death. Equipped with 3 fire arms of choice and a knife for melee you run around the map taking on opponents in creative settings. The game can played a multitude of ways from death match with teams or death match without teams. Controls are basic enough to pick up and get into the game right away. The left thumb analog is for movement while swipe around the screen to look around. You then have a shoot and jump button to interact with opponents and obstacles. Tapping on your weapon allows you to cycle through them. You can play games with up to 15 enemy CPUs on the map for total chaos. There are also other modes like multiplayer & challenge mode to keep the game interesting. Additionally the game allows you to get creative and build your own maps. The map editor is really comprehensive and allows you to fly around and build your own unique map adding in what you please and where you please. You can then choose to import or export said maps for others to try out and play. This is where the real creativity meshes with that of the action. CraftedBattle allows you to build the battle grounds in which you’ll fight to death. AI for the most part plays efficiently and offer up a challenge in single player mode. If theres any gripes I have aside from the graphic rip off of minecraft its the aiming system. The aim isn’t to accurate and I found it hard to shoot from time to time from long distance. Overall CraftedBattle is a sandbox title meets action based FPS. The weapon system isn’t vast but its enough to mess around with and have fun. Running through custom made maps and shooting at bots or friends does provide for a rich sort of experience being able to play in something you helped make. 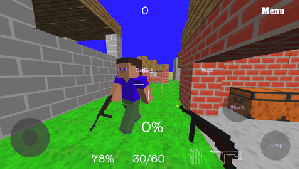 Fans of the minecraft genre will enjoy this at $1 its guns and actions layered on Minecraft. So you can’t really go wrong despite the battle system deficiencies the creativity mode and map editor almost makes up for its flaws. At $1 its not much that I can complain against. If your looking to build and create unique maps like that of Minecraft and use them to fight against deadly AI and friends look no further than CraftedBattle.